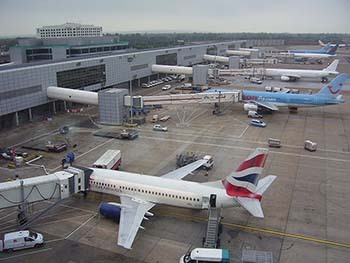 Gatwick International Airport is a smaller airport 28 miles south of London with air services to Europe. 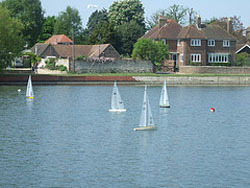 The complex is easily navigable. However it should be noted that there are two terminals, North and South. Details and map of the terminals can be found here. 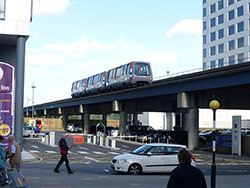 The Terminals are connected by a three quarter of a mile two way people mover track transit system, driverless trains. Road and rail transport are frequent. M23 at Crawley in Sussex looking north to GatwickPhotograph by Kentem in the public domain. 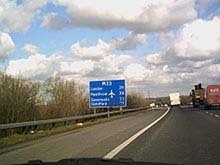 There is road access to the M23 and the A23 which is the London to Brighton road. Northward this connects with the M25 the circular ring road round London. 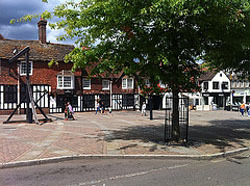 There is access to Reigate via the A217. Between them these roads provide access to the west depending on the area required, Make for the A303 or the A30, both good roads to the west. Hire cars are available from all popular firms. A simple idea is to book online in advance on this site, please click the link above. (no booking fees!) Or you can book online at Gatwick Airport. 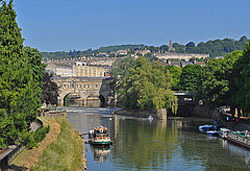 In both cases most of the popular car hire firms are available. This is a large airport and it has loads of car parking. 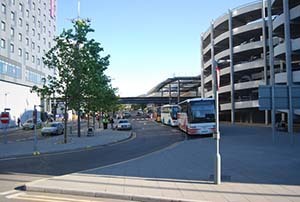 Both North and South Terminals have long stay parking with connections by bus from the car parks to the terminals. Valet and Premium parking is also available at both Terminals. Short Stay Parking is very close to the airport and handy if you are only there for a short period. National Express coaches call at Gatwick International Airport as part of their major airport link services. Pretty handy, hassle free transport. 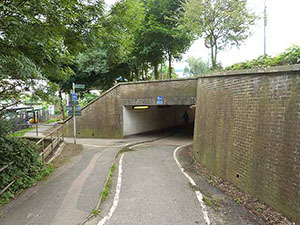 Sustrans National Cycle Network Route 21 actually goes under the South Terminal. There is even a lift to ground level for cyclists in Zone 1 – look for the signs. Route 21 goes more or less traffic free to Horley to the north and Three Bridges and Crawley to the south. For further information on cycling in Wessex go to the Cycling in Wessex and the Cycling in Southwest England pages. If you are coming with hiking boots as a companion check out the Walking Trails pages. First Great Western trains use the station and provide services directly to Reading, Oxford and the counties of South West England. 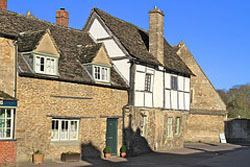 Accommodation in the vicinity is plentiful and the local area specialise in B & B to cater for passengers to and from Gatwick. Horley is a good bet. Booking is an excellent idea however! Some B&B's will pick you up and take you back to the airport, a very useful idea. 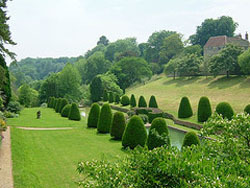 Mapperton Gardens, near Beaminster, Dorset.